The essay competition ‘Inside the Black Box‘ asked students to join the debate on Official Development Assistance (ODA) and to come up with ideas on how to improve it. Pushing further, it was a campaign to reach policymakers who may be able to restructure ODA. We spoke with Education Director Dr. Lutz Krebs in the soundcloud above and team member Tamara Kool in the blog post below. The winning essays, in the form of a working paper, are embedded below. 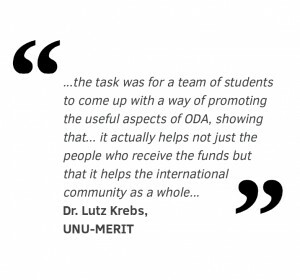 Beginning 2014, students from the September 2013 cohort at the MSc in Public Policy and Human Development (MPP) were invited by Prof. Bart Verspagen, Director of UNU-MERIT, to raise awareness about Official Development Assistance (ODA) among a target audience of our choosing. Following this call, a group of students – Ian Freeman, Charles Low, Tamara Kool, Sam Salsal and Emilia Toczydlowska – came together and developed a proposal called ‘Inside the Black Box’, a campaign encouraging students to get involved in the debate about how Official Development Assistance (ODA) can be improved and to distribute these results in a publication to senior-level policymakers who have the potential to contribute to restructuring ODA. We planned a twofold strategy. First, we contacted research institutions, governmental institutions and consulting firms worldwide to ask them to endorse our project; this resulted in a very positive video by Erik Solheim, chair of the OECD’s Development Assistance Committee (DAC). Additional support came from the Effective Development Group, the Foreign Policy Research Institute (FPRI), Clingendael and the Deutsche Institute für Entwicklungspolitik. We also reached out to many more institutions, which in turn expressed an interest in receiving the publication. Second, we launched a competition that gave students the chance to connect with policymakers and have their recommendations heard. The competition — the main part of the campaign — invited registered students for the 2013/14 academic year to present original and innovative ideas on how to improve ODA’s effectiveness in 1,000 words or less. From April to June, we reached out to students through our website, social media and a series of eye-catching posters. The website was the backbone of our campaign, featuring not only the entry requirements but also research results and blog posts on issues surrounding ODA. Our Facebook and Twitter campaign gathered entries from across the globe: from the Netherlands, New Zealand and USA to Kenya, South Africa and Zimbabwe. Over the summer of 2014 the competition entries were judged by a panel of specialists in the field of ODA. Judges included representatives from the Effective Development Group, FPRI, Deutsche Institute für Entwicklungspolitik and UNU-MERIT. Essays were judged on five criteria: creativity, feasibility, extent of research, concise writing, and quality of presentation. In late August 2014 we were pleased to announce the winners of the competition: Michel Kasusa Makinga, followed by Sarah Wagner and Kudakwashe Dube. As part of the prizes for the winner and runners-up, Inside the Black Box transferred a donation to an NGO of their choice. A donation of €1,000 was made to Save the Children International, plus €500 to Instituto Teko Guarani in Glew, Argentina, on behalf of Michel Kasusa Makinga and Sarah Wagner, respectively. Besides the donations, the first prize was an iPad, the second a €100 Amazon voucher, and the third a €50 Amazon voucher. With the Working Paper ‘Inside the Black Box: Contributions to the Discussion on Official Development Assistance’, we have reached the final stage of our campaign. 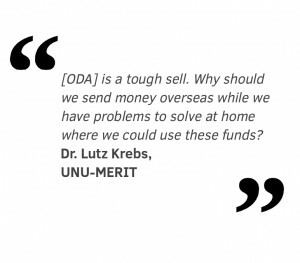 We are very proud to show you a selection of entries that present ideas from future leaders and university students on how best to improve the effectiveness of ODA, despite the maze of difficulties surrounding the issue. We hope you enjoy the read.